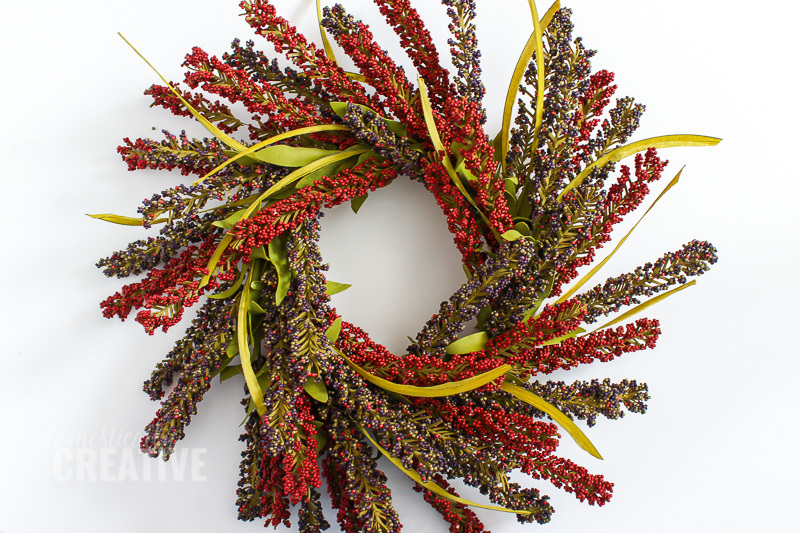 Make this simple and rustic Fall berry wreath for your front door, or just as a wall accent this season. The reds and purple hues are perfect for Fall, and can fit in to any decor. 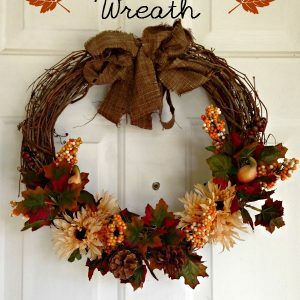 When it comes to the seasons, I am a sucker for making a new wreath. 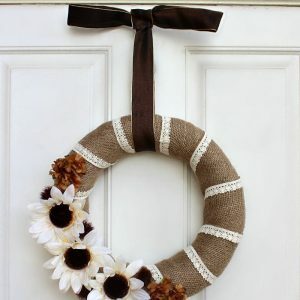 For me, a wreath is an easy way to dress up your front door and they don’t cost a lot of time or money to make. So when I ran into Joann’s a few days ago, I was drawn immediately to their Fall florals. Even better, they were on sale for 50% off! 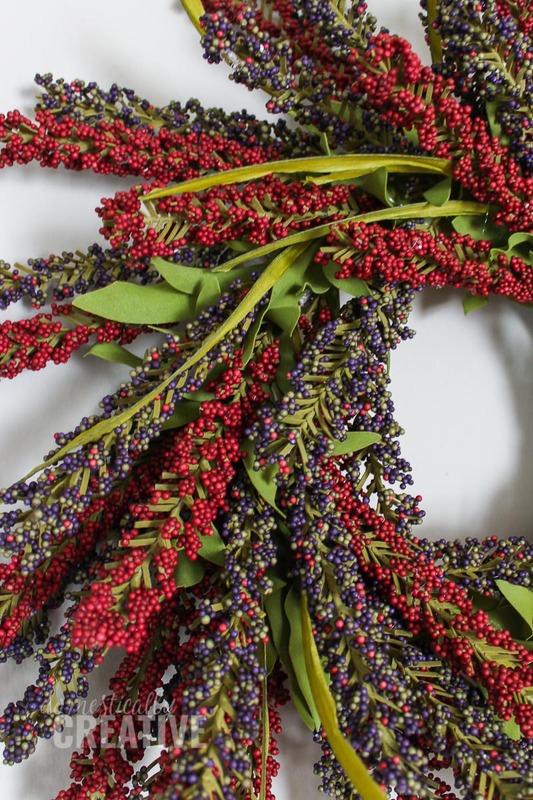 I quickly snatched up all of the bunches of these Fall berry stems they had because I knew I could create a beautiful rustic Fall berry wreath for my front door. 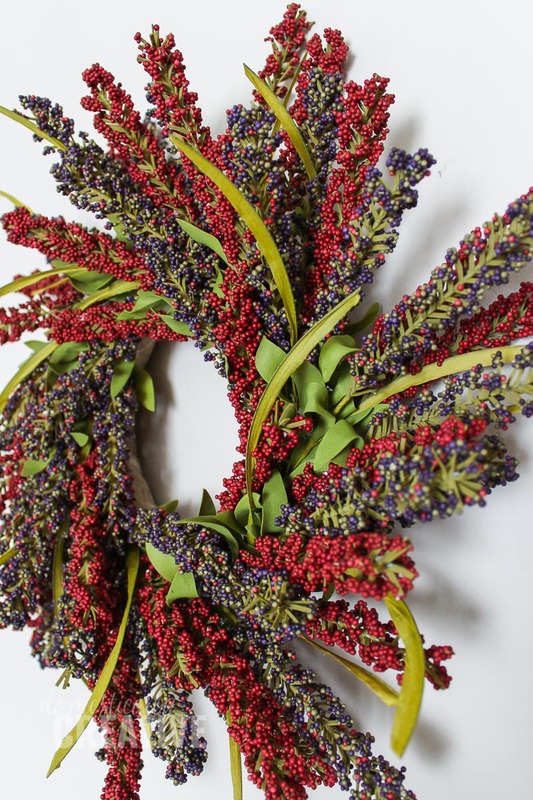 The reds and purples really play off each other well, and are great colors for a Fall wreath. I was a little bit worried how the red would look against my bright red front door, but decided to go for it anyway! Since I was starting with a green foam wreath form, I decided to cover it up with some burlap ribbon I had lying around. 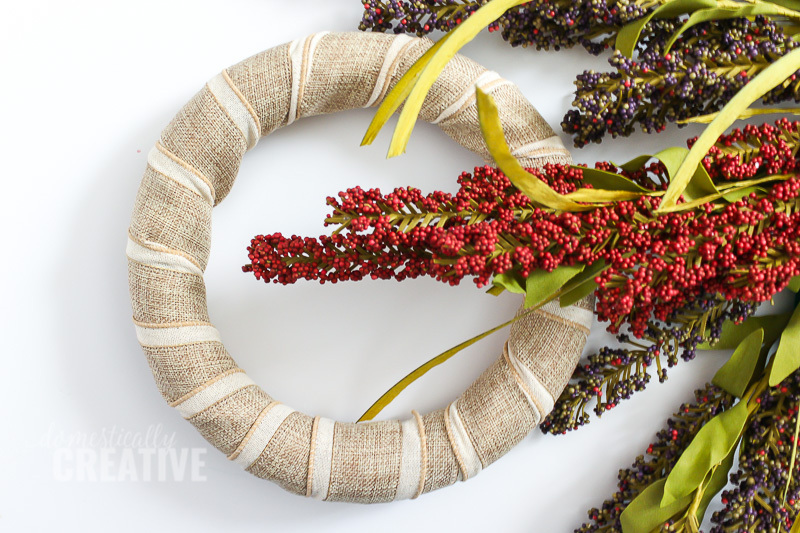 You can skip this step if you wish, but I really didn’t want that green floral foam color sticking out in between any gaps in the finished wreath. Next, I cut each berry stem away from the larger piece to end up with 5 individual stems and leaves from each bunch. 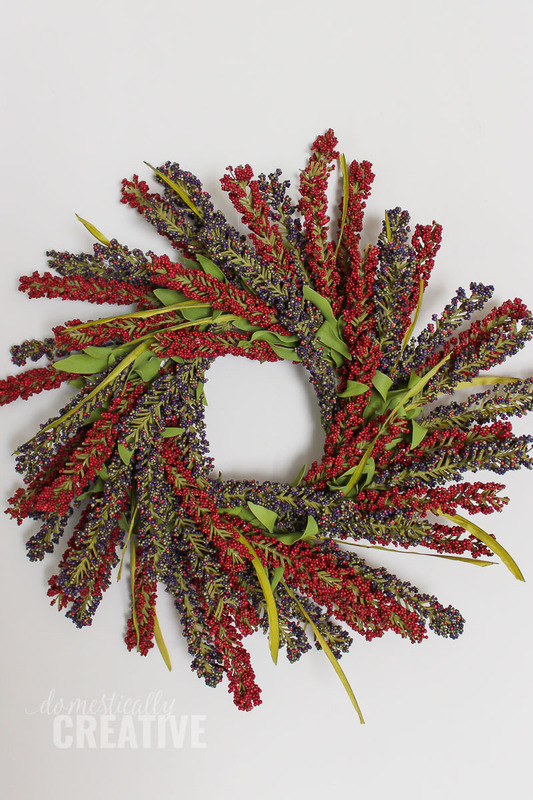 This gave me plenty of berry stems to make the finished Fall berry wreath nice and full looking. Once each bunch was cut into individual stems, I simply glued them down onto the wreath form, keeping with a “pinwheel” look and alternating colors. After I went around the wreath form with a base layer, I went back over and filled in the gaps to make the wreath really full. 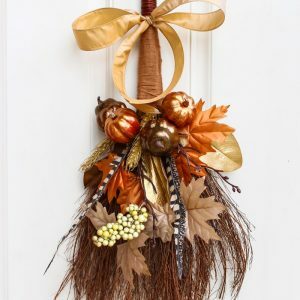 You could dress it up even further by adding a burlap bow, or even some small pumpkins or other flowers. I decided I liked the wreath in it’s simplicity and called it a day. Who knows, maybe I’ll add a burlap bow to it later on. 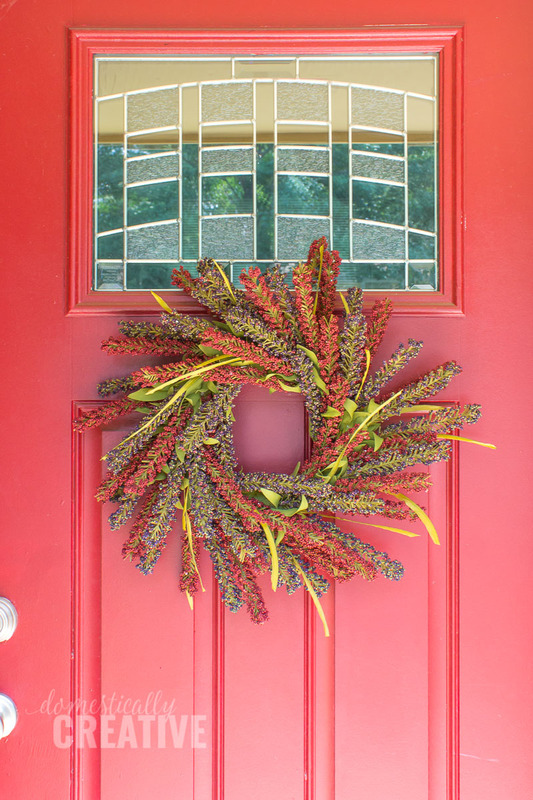 I was pleasantly surprised at how much I loved the finished fall berry wreath on my bright red front door. I thought for sure the dark red berries and bright red paint would clash, but I think it’s just enough of a difference that it works. What do you think?